Just as the stars can be your compass at night, there is another star to guide you during the day and that of course is the Sun. Sunrise/Sunset. We are taught that the Sun rises in the East and sets in the West; well that is true on only two days of the year, the Vernal and Autumnal Equinoxes. During the rest of the year, sunrise will be between north east and south east while sunset will be between north west and south west; however, all we really need to know in a survival situation, is that sunrise is approximately east and sunset is approximately west. Between Sunrise and Sunset. Fine, we can find east and west at dawn and dusk and from there we can align ourselves with north and south but how do we manage between these times? Well, there are several methods that we can use depending on whether we are on the march or we have time to stop. The Watch Compass If you are lucky enough to have an analogue watch, this can serve as a substitute compass. Make sure the watch shows the time for your locality (standard time if on land or zone time if at sea). Imagine a line from the centre of the watch face to the 12 o’clock position and then imagine an angle between that line and the hour hand as shown in the diagram. 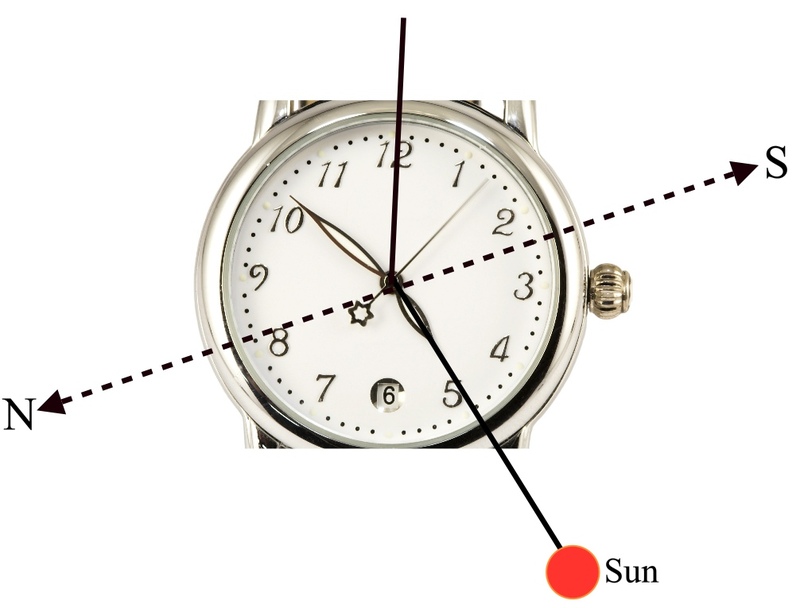 When in Daylight Saving Time (Summer Time) use the 1 o’clock position instead of 12 o’clock). If you are in the Northern Hemisphere, the line bisecting the small angle will point towards the South and the line bisecting the large angle will point towards the North. If in the Southern Hemisphere, it will be the other way round. 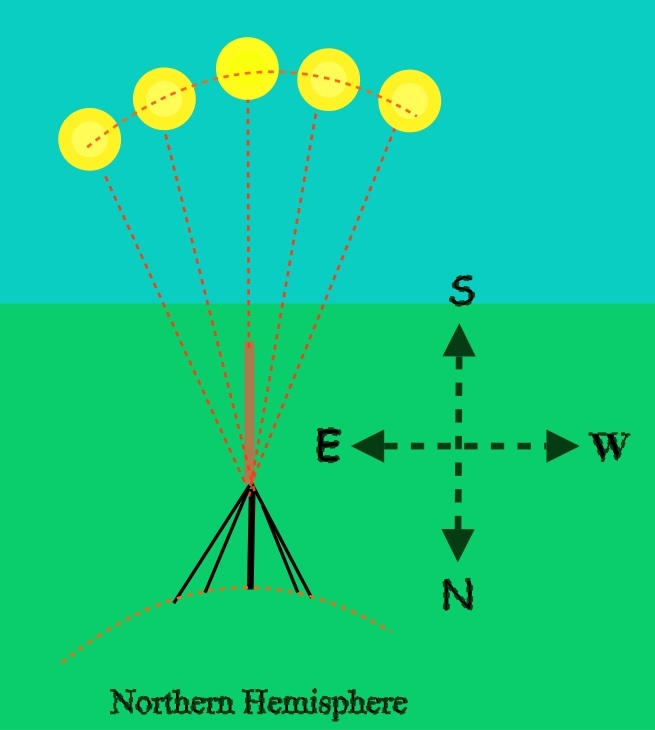 This method is based on the ‘True Sun’ (the Sun we see in the sky). However, clock time (mean time or standard time) does not keep in step with the True Sun and so the watch compass will not always exactly indicate true south or true north but it is close enough for survival purposes. If you are in the tropical zone (23.5o north to 23.5o south), you may have difficulty with this method because the Sun will sometimes be to the north, sometimes to the south and sometimes, exactly over your latitude. Never look directly at the Sun as this can seriously damage your eyes. A piece of smoked glass can easily be made for use as a light filter; simply hold a piece of glass in the smoke of a candle or oil lamp until it is covered in a layer of smoke residue. Shadow Stick If you do not have an analogue watch, you can still use the Sun to find your direction as long as you have time to stop in one place for a while and if there is sufficient sunlight to make a shadow. East / West Shadow Stick Method. Place a stick in the ground and mark the end of the Sun’s shadow with a stone or some other object. Wait for half an hour or more and then mark the point that the tip of the shadow has moved to. Scratch a line in the ground to join the two marks. (If the terrain is not suitable for this, use a piece of string or a straight pole etc.). 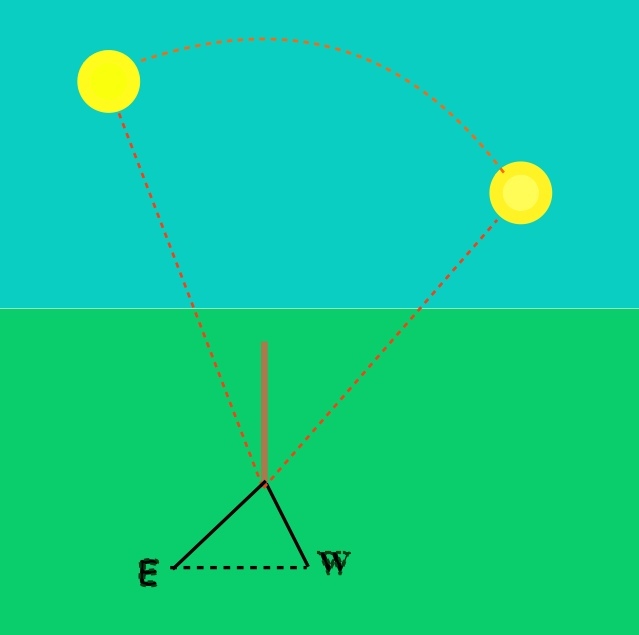 Because the Sun moves from east to west at 15o per hour, the line that you have drawn will also point east and west. North / South Shadow Stick Method At noon, the True Sun will be over the meridian of longitude of your position and will have reached its highest altitude for the day. Because of this, shadows cast by the Sun at this time will lie from north to south and so indicate those directions for us. Judge when the Sun is approaching the highest point of its path across the sky. Place a stick in the ground and mark the tip of its shadow. Draw a line from the base of the stick to the tip of the shadow. About 5 minutes later, mark the point that the tip of the shadow has moved to and draw a line along the length of the shadow as before. Repeat this process several times. The shadow will become shorter as the Sun approaches its highest altitude at noon and then it will begin to get longer again. The shortest shadow occurs when the Sun is at its highest altitude and this line will lie north/south. In the Northern Hemisphere, the end of the shadow nearest the stick will point to the South at noon and in the Southern Hemisphere, it will point to the North. Never look directly at the Sun as this can seriously damage your eyes. Again, there may be difficulties with this method in the tropics. If you have a watch but you are not sure of the time, you can set it at noon as indicated by the shortest shadow. Survival Sundial. If you are camped in one place for a day or more, you can make a survival sundial which will not only serve as a clock but also as a compass. Click here to learn more about the survival sundial. The Pointing Method. If you do not have time to stop and you do not have an analogue watch, you can always use the ‘pointing’ method to keep you on course. Face the direction in which you plan to travel and point in the direction of the Sun. Hold this position for a few seconds until the Sun’s direction relative to your body is imprinted in your mind. Set off on your chosen course keeping the Sun in the same relative position. Stop every ten to fifteen minutes to reacquaint yourself with the Sun’s relative position, bearing in mind that it covers 15o per hour as it makes its arc across the sky. If the Sun is obscured by cloud, you can adapt this method by using a tall object such as a church spire or mountain to point at. You can also adapt the method by noting the direction of your shadow instead of the position of the Sun. This entry was posted in astro navigation, astronomy, celestial navigation, navigation, Survival, Uncategorized and tagged astro navigation, astronomy, celestial navigation, navigation, survival, survival - astro navigation, survival - navigation. Bookmark the permalink.